Hi everyone! Happy Wednesday evening. 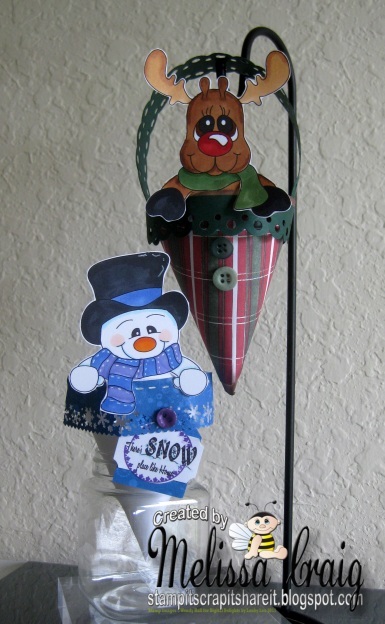 I was off today so I got a chance to play a little as well as continue to work on the stuff that I am doing for the Winter Wonderland craft sale next week. I still have more I want to do, but I'm afraid that time isn't on my side. So I'll just do what I can and hope for the best. So I created this card using a sketch from ICSketches. This worked perfectly with the image I chose to use. I am also pulling up my bootstraps and working up my nerve to participate in challenge over at iCopic Lover. I have always wanted to play along, but have never considered myself worthy. I still don't, but at least I'm trying. Please be honest, tell me what you think of my attempt at vintage. I distressed everything! I inked it all, I wrinkled, I scraped it... it's all on there. I even tried the cracked glass technique and for the first time in my life... it worked!! Here's a close up of the image. You can't quite see the shine, but you can see the cracks. I am soooo excited about this. I do hope you enjoy my card. Thanks for visting. Enjoy your night. Good Morning! Week off to a good start? Monday is over and I'm off tomorrow, so it's a good thing. We have a fun sketch over at Tuesday Morning Sketches and a new sponsor. Stretch n Bubbles is sponsoring this week. 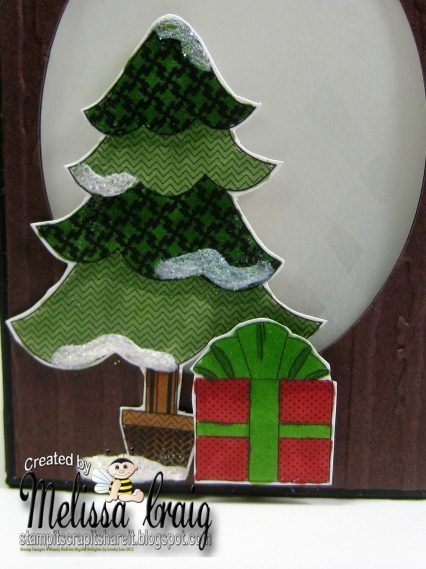 Here's my card using one of their adorable digi images. I am not super happy with my card - I really think I should've done more with my swirls like I planned. I wimped out, I guess. But I do love the red and yellow. I do hope you'll head over to TMS to play along with us this week. Enjoy your Tuesday. Good Morning! 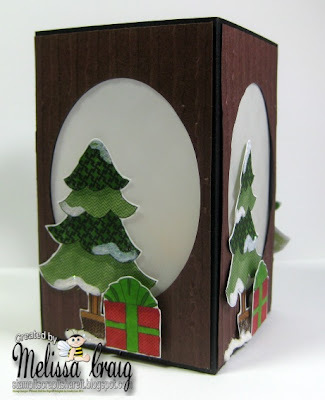 There's a new release over at Paper Pretties, so we're off this week for the digi team challenge. So, today's card is just for a fun. I am joining a couple of other challenges, the sketch is from The Sweet Stop and my friend Joni's challenge at Raise The Bar is to create a thank you or grateful card. I really had a lot of fun with this card. I love the colors and doing the reflective technique. I did design my own mini pizza box. The card stock measures 5 1/2 x 10". I scored at 1" on the left and right sides long ways. Then scored at 1", 4 1/2", 5 1/2" and 9". This will give you a 3 1/2" squared box. I used my Scor-Pal. 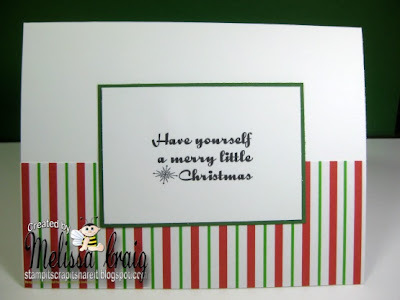 I didn't take a picture of the inside, but I did stamp "To" "From" and "Merry Christmas" - I'm thinking of going back and punching holes and adding some ribbon so that they can be tied to a package. Or I can whip up some envelopes. I haven't quiet decided. Hi! It's me again. I am back here to bring you another challenge. This time we're creating gift cards. You all have heard the saying that big things come in small packages. Well, I know for sure that if I give my youngest son a gift card to Game Stop, he's in 7th heaven. So why not treat someone to a special greeting that gives something sweet and special. 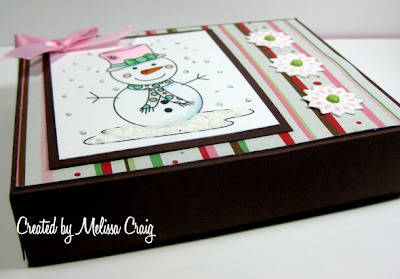 This one I created with an envelope, a crimper and, of course, Cocoa. I am playing at my craft table this whole weekend.... at least that's my intention. I have a lot I want to do to get ready for a Winter Wonderland at work. So to play along with some of the challenges at Sweet n Sassy VSN forum, this is helping me accomplish what I want to. Korin is challenging us to create an all white card. No decorative paper, no other color except what goes on the focal image itself. I am pretty certain this is a first for me. So, I must tell you, that my daughter Hollyanne colored this image for me. She wanted to color with me the other night, so I gave her this one. She did such a great job, that I thought it was perfect for this card. 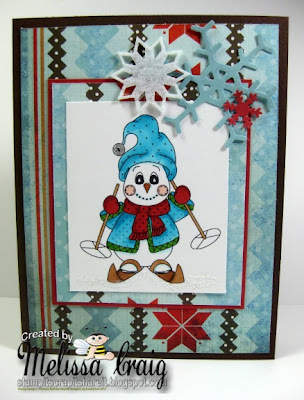 It also fits the challenge over at Crazy 4 Challenges is to have snow on your card. OK, be honest, you're totally loving this weekend of fun fun fun challenges just as much as I am right? I have seen some pretty phenominal projects so far and *squeal* there are more to come!! So now we come to my challenge - and this is such a fun challenge! Let's get dual purposed with our card. 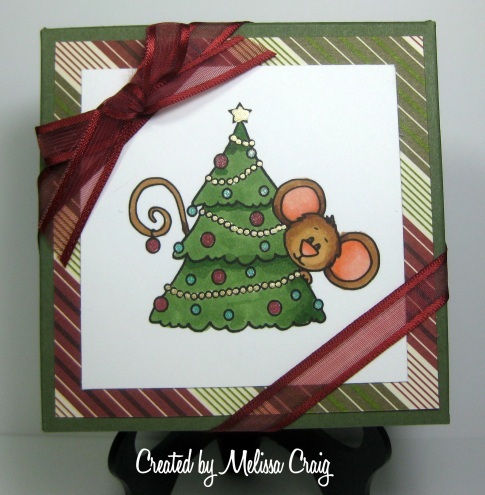 My challenge is to create a card with a detachable ornament. First, I printed this really great digi paper that I got for $1 at JessicaSprague.com, it's an Echo Park collection. I still have more to learn about how to get postioned correctly on the card base, but I got closer. I then added a text box for my greeting. It was perfect for the sweet snowman image, Smiley Snowman. 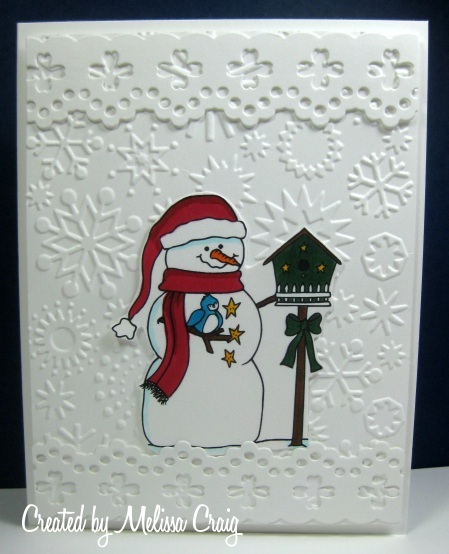 The snowman is adhered to the card with temporary adhesive and his hanger is hidden between the layers. He's actually 3 images thick. 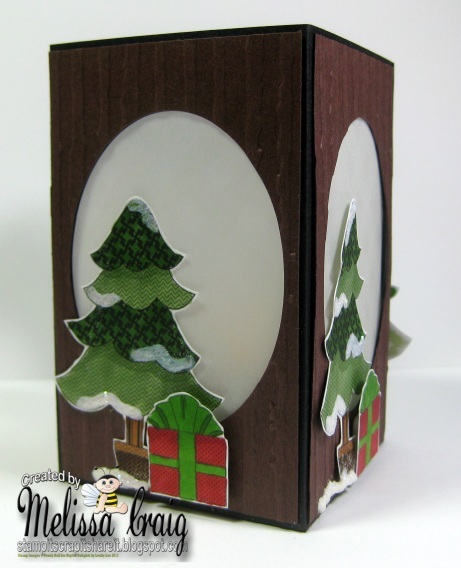 Be sure to head over the Sweet n Sassy Stamps Forum here to get in on this challenge and all the others. I'll see you later for the other challenge I have to share with you! Hello again - here's my next post for the day. You didn't think I'd forget the Delightful Challenge did you? Be sure to scroll down for the MTME Pretty Patterns Challenge. These two would work together well. I had found another luminaria tutorial on SCS when I created the one I did for Halloween and decided to put it on the back burner for later. Well, it's later, so I had to play. This one was so easy! 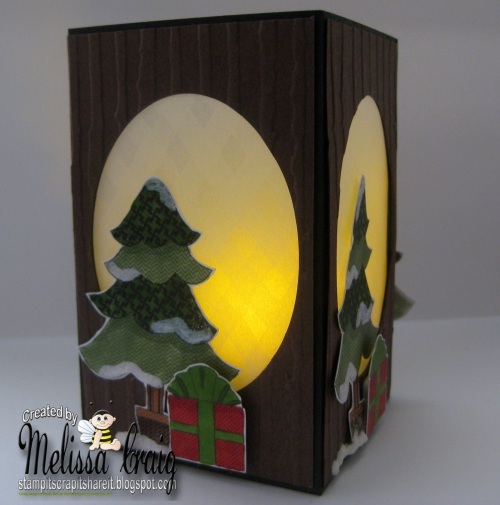 One piece of card stock creates the luminaria and then just decorate! Here's a close up of the images. I added white Puffy Paint and while it's still wet, I dusted with diamond glitter. I hope my little project inspires you to play along with us. If you're a bigger stamping fan than you are a football fan, then leave the football to the guys and play a little. Enjoy your day! Good Morning! Oh my goodness, I am so late with my posts!! I was so busy with some preparations for today that I forgot to get my posts ready. MTME Pretty Patterns #37 is up and ready and I LOVED this sketch. There is soooo much possibility in it, the DT did an amazing job. 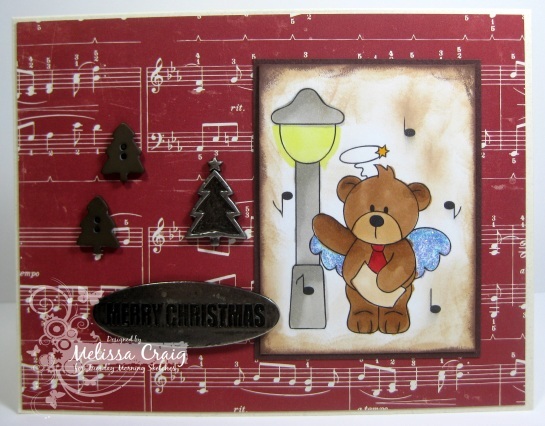 I am really pleased with my card. What do you think? My card features Mrs. Candy Clause digi paper and a sentiment that is from the Beautiful Baubles set. Lauren has her digis in .png format so you can print digi paper and the sentiment at one time. 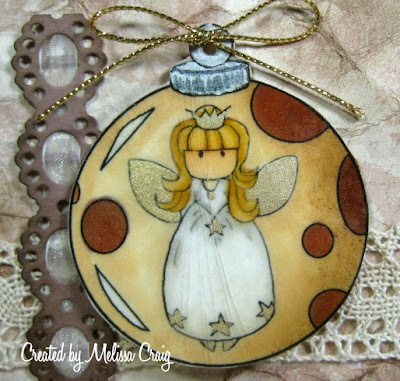 The little bauble in the middle is opaque so it had it's white space for coloring. Wonderful! Be sure to join us in the challenge this week. Now head on over to the blog to see the amazing projects the girls made! Good Morning! 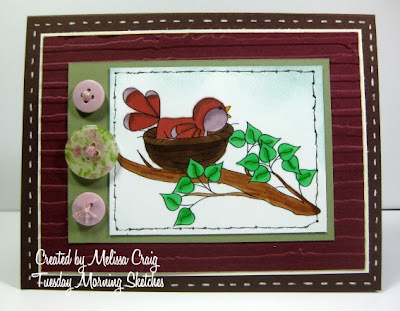 It's Tuesday and we've got a great challenge for you at Tuesday Morning Sketches. The sketch was created by our very own Dawn - so much fun and so open for interpretation. Be sure to head on over to check it out. The challenge this week is sponsored by Stamp Fairy. I found some really great metal embellishments and tree buttons that worked so well with each of the elements on the sketch. Please join us this week - it'll be a lot fun! I created this card with a nice sketch from Arlana at Sweet Sketch Wednesday. I miss playing along with Arlana's sketches, but I do try to get one in every now and then. I do hope you'll head on over and join us this week! Please check back later today for the challenge from Paper Pretties. 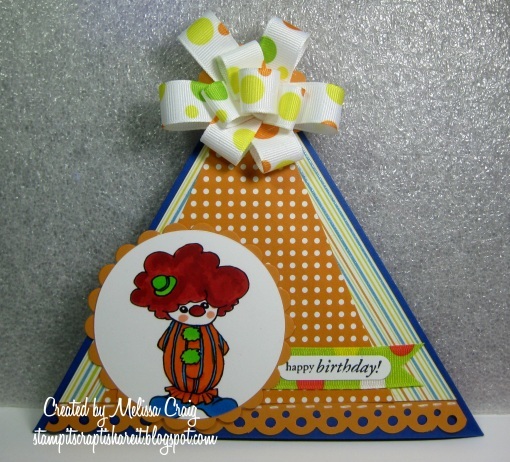 But first, we're kicking off a fun birthday blog hop for one of our favorite Paper Pretties artist... ARTish! If you came here from Lisa's blog then you're on the right track to wishing the birthday girl sweet birthday wishes. 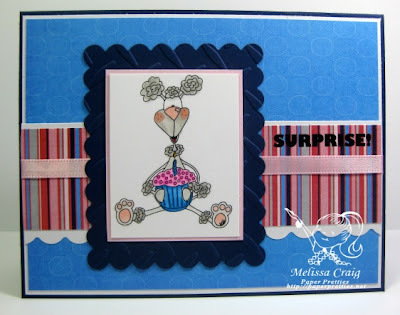 I got help with creating this card from the fabulous sketch at The Sweet Stop. This was perfect for this card! I did flip a couple of elements, not intentionally, but it worked. ARTish - I hope your birthday is all that you wish for and so much more!! Your next step on the blog hop is Nancy's blog. You know how it seems that you've got plenty of time to do what you need to do when you're given plans way in advance, that you run out of time? Well, that's what happened to me with today's post. 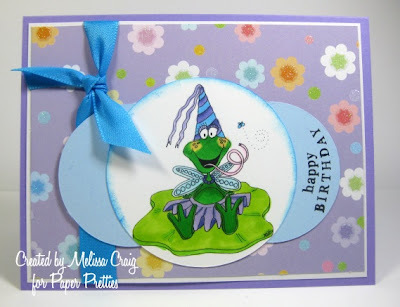 Today is Prettie Girl Taylor Usry's birthday and we're celebrating in Prettie style - a blog hop! But I ran out of time and wasn't able to make a card, but I wasn't going to miss saying Happy Birthday to Taylor. I hope your day is beautiful and bright! Now head on over to Nancy's blog, she's the next stop and don't forget to leave some love for the birthday girl. Hi - it's me again. If you're here cuz you're stopping by to see my Digital Delights post, just scroll on down. 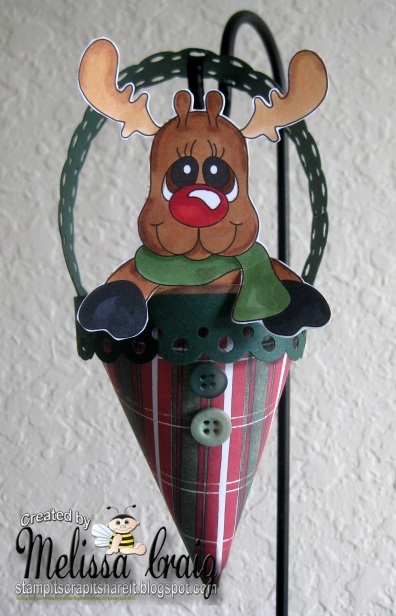 But since you're here, you might as well check out this other super cute project I created with this week's Pretty Pattern from My Time Made Easy. Now, I know Lauren has some really awesome Pretty Packages available in .svg and .pdf formats, but this was so easy with one piece of cardstock and a scoring tool. Following directions for a mini pizza box that I found on Scor-Pal's site and then doing what I wanted to do, I made this "Warm Up Kit." For a mini pizza box, the cardstock will measure 6" x 11" that when scored and folded will create a 4" x 4" pizza box. 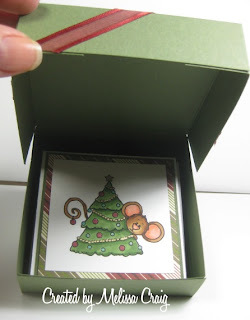 My card stock measures 7" x 11" with finished box of 4" x 5" rectangle. 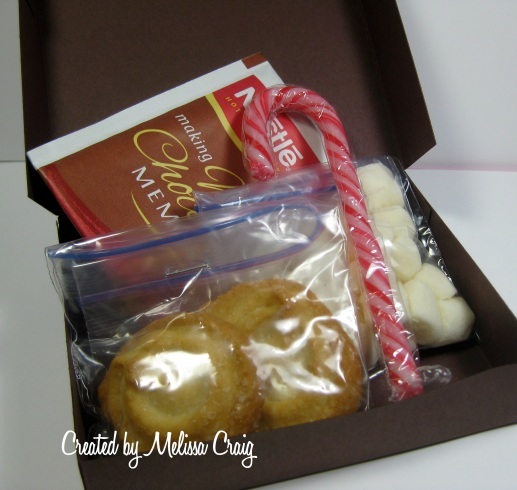 This box is large enough to hold a hot chocolate mix, some mini marshmallows, a candy cane [stirring stick] and a couple of yummy butter cookies. You could even hide a cute little message on the inside of the lid. Thank you for visiting me again today. 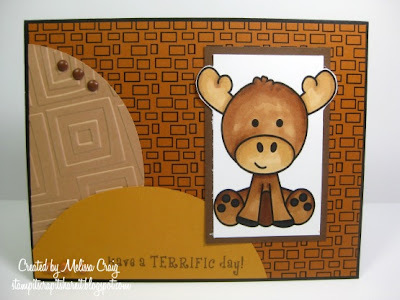 Please join us this week for a fun Pretty Pattern at MTME. Enjoy your Thursday! Good Morning!! I cannot tell you how excited I am for this day. I have created some really fun things to share with you today. So we'll start with this week's challenge at Delightful Challenges is we're playing BINGO. Now I like this kind of BINGO! I created goodie cones featuring Christmas Toppers. Now I don't have them filled because I couldn't decide on what to put in them. So I'll leave the filling to your imagination. I made them following a tutorial (loosely) on Splitcoast Stampers. I made the toppers big enough so that it appeared the cone part was part of their bodies. I am so proud of these - I made them over a month ago and it's been killing me not to share them with you. I am soooo happy I can show them to you now. I hope you love these little guys as much as I do. Now head on over to Digital Delights to see the rest of the team's inspiring projects! Good Morning! It's Tuesday and it's the week of the Judged Challenge at TMS. 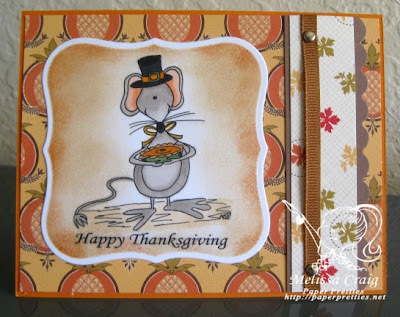 So I have fun sketch and the added twist is to Give Thanks. 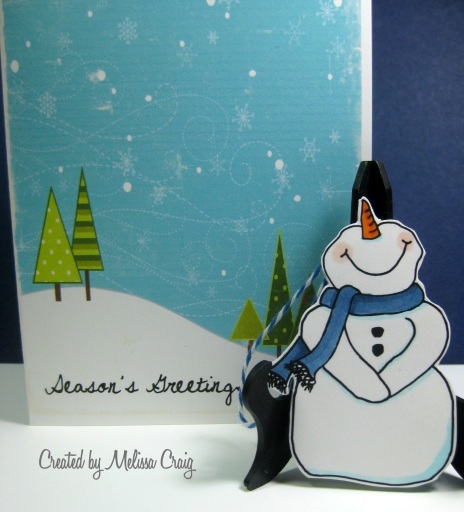 Our sponsor this week is The Stamping Boutique so I created my card using an adorable snowman from Tracey's store. Isn't he cute? And then I found this really cool glitter paper in my stash! This card came together so easily, gotta love that. So head on over to play along with us. Good Morning! I hope you had a good weekend. Ours was pretty low key - didn't do much of anything. I did play at my craft table for a little bit, but probably not as much as I should have which means I'll regret the low key downtime later. So we're back this week with a challenge over at Paper Pretties. It's the season to celebrate thankfulness and fellowship. So ARTish has come up with two great new images that illustrates this so wonderfully. Isn't he sweet holding is yummy (bleh) pumpkin pie. OK, truth be told, I'm not a fan of pumpkin pie, so I'm pretending he's holding a pumpkin cheesecake (mmmm). The sketch is from The Sweet Stop and Our Creative Corner's challenge is to use either pumpkins or the color pumpkin pie. I used all 3 - pie, color and pumpkins. Please come by and join us at Paper Pretties. You'll have fun. I promise. Good Morning (again)! Have you been enjoying the 12 Days of Christmas? There's been some pretty sweet cards and projects featured. 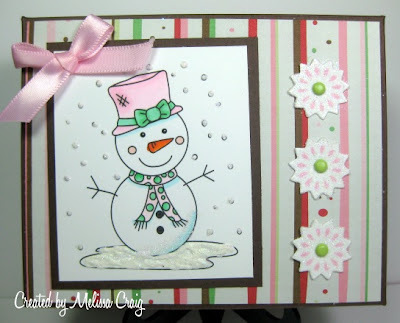 The challenge this week is to add Snowflakes to your project. 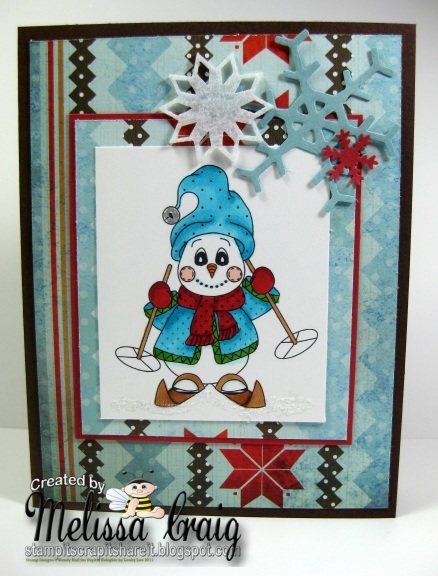 Here's my card featuring the new release image Skiing Snowie McFee. Oh my goodness, isn't he adorable! 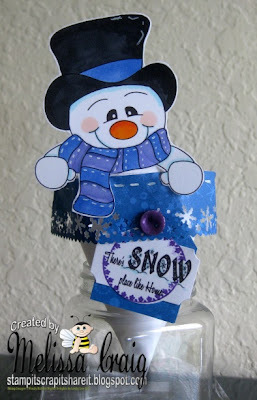 You all know I am such a sucker for snowmen - they melt my heart - so I had to play with this little guy. The paper worked perfectly with the snowflakes that I've had for awhile that I received from a swap. These are the neatest felt snowflakes. Be sure to head over to play along. You'll be glad you did! Good Morning! I look so forward to Thursdays - it means the week is just about over and no plans for the weekend... love that! So this is my second week with MTME's Pretty Patterns and I am really loving working with these digis. The sketches are great and sooo versatile as you'll see when you head over to visit the DT line-up. What inspiring samples! Mine is so super basic, but I think super cute and great for a child. This card features an adorable moose from the Wonderful Woodland Creatures set and the Construction Materials digi paper. 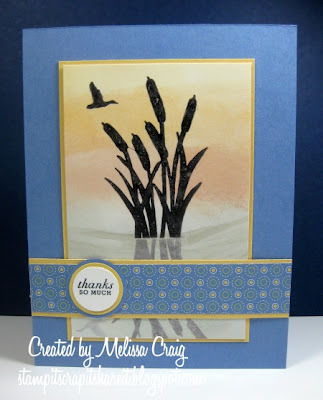 I love the texture that this digi paper added and it worked so well with the Traffic Jam embossing folder. I hope you'll join us this week and every week for the month of November - there's a sweet Pretty Package available. Enjoy your Thursday. Good Morning! Enjoying your week so far?? We have a really fun sketch over at Tuesday Morning Sketches that was created by Kathy. Our sponsor this week is There She Goes. I finally inked up a set that I've had for awhile and I am thrilled with the results. What do you think? 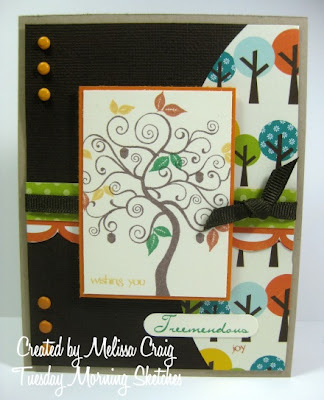 The Treemendous set worked very well with the paper that I selected from Echo Park.... LOVE these papers! Thank you for stopping by! I do hope you'll head over to TMS to join us this week. There's a $25 prize up for grabs. Good Morning! I love it when we can change the clocks back an hour. I feel like the day lasts longer, I feel like I've slept in but I'm actually up at a decent hour and it's Sunday.... my day to play! The sketch over at Just Us Girls called for a triangle card. Hmmm.... what to do with that. Well, I thought birthday hat! So I found a template somewhere (my apologies to the person who did come up with this) and couldn't figure out how to download it, but it was simple enough to figure out (see mine below). 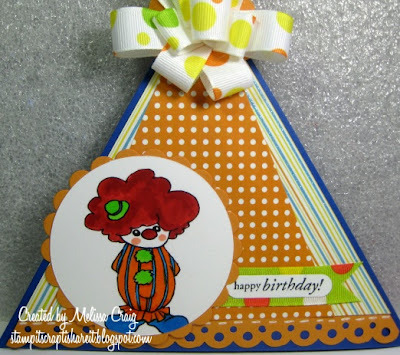 My card also works for a challenge blog I just found.... Birthday Sundaes. This week's challenge is to include birthday wording on the front of the card. OK, so here's the general template. 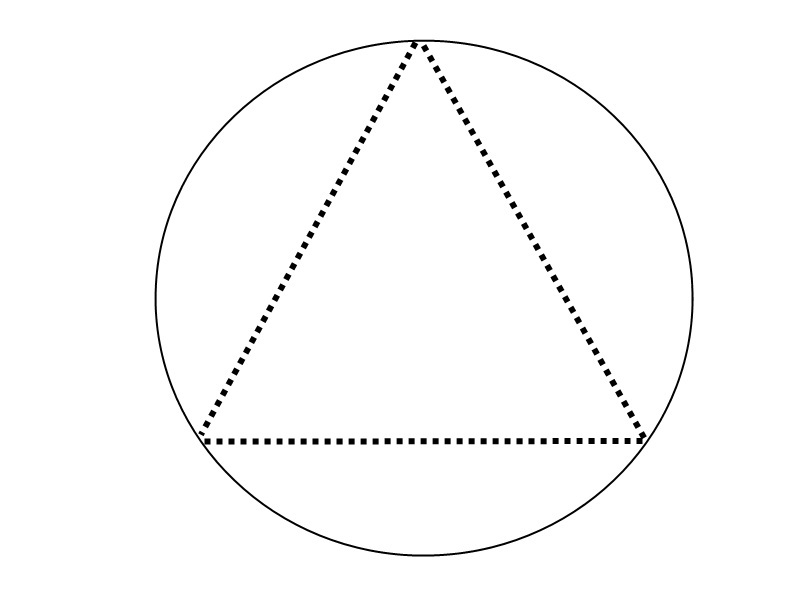 Cut out a circle and then score in a triangle. 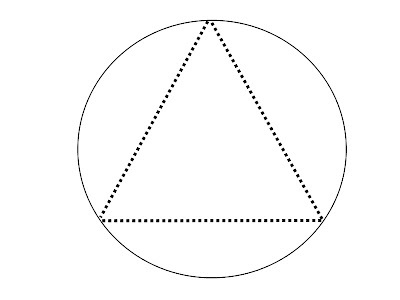 I did this by lightly drawing the lines with a pencil and ruler until the "sides" were about equal. Using my Scor-Pal, I scored. This card will hold itself closed using the same concept as the over/under thing one does with a cardboard box when wanting it closed without tape. I hope that makes sense. I wish I'd taken a picture of the back, but I was short on time. Anyway, it's a fun card. I had fun making it and the birthday boy was very happy! All is good. Thanks for stopping by. Hello everyone! I have news! 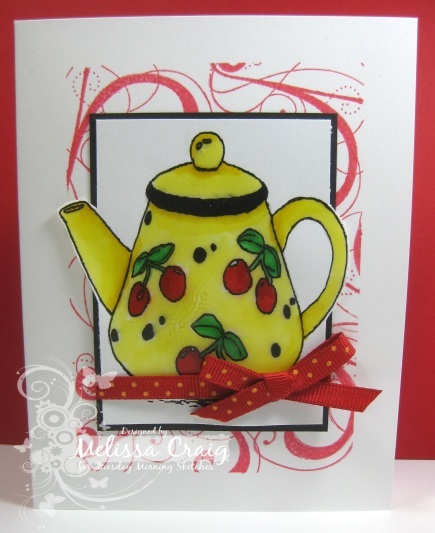 I have shared the last 4 weeks on my blog my entries for my DT application to My Time Made Easy Pretty Patterns team. I made it!! I was so excited to get Tangii's email on Monday. She said I didn't have to start right away, but you all know me.... why wait! So, jumping in with both feet, here's my first card on the team. It's a real easy, very versatile sketch. 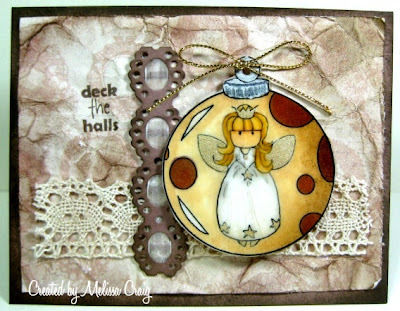 I used Beautiful Baubles and Mrs Candy Claus digi paper to create a ornament that will detach from the card base. 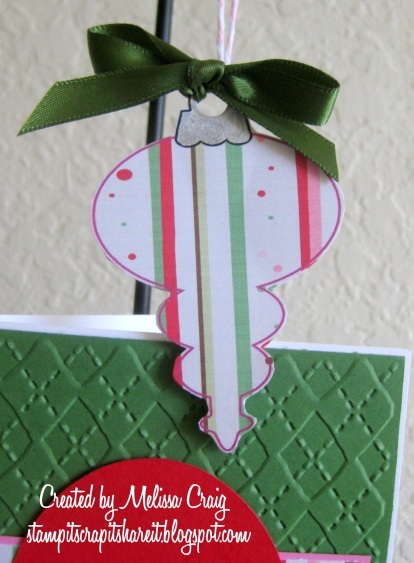 The string is pushed between the layers for a tidy presentation and then the ornament can be removed, the string taken out and can be hung on the tree. I do hope you'll join us this week at MTME Pretty Patterns. Have a great Thursday! Thank so much for stopping. Good Morning! I cannot tell you how happy I am that's it Thursday! It's been a pretty good week so far and there's cause for celebration... the 12 days of Christmas is underway at Digital Delights and there's a new release today. 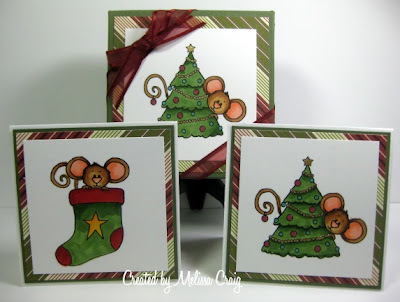 Wendy has some really adorable Winter/Christmas images releasing. Now is the perfect time of year to get those holiday projects and greeting cards ready to go in the mail. This is Santa and Poppet. The photo doesn't capture the amount of glitter that went onto this card! 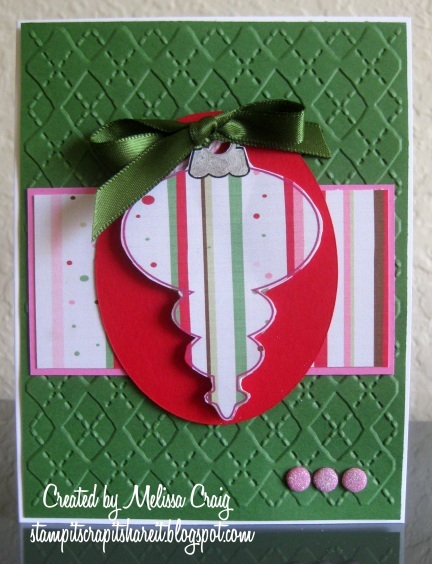 My card also features Candy Cane Lane digi paper and A Touch of Christmas sentiments. Come join us this week! You'll have lots of fun. Good Morning! Happy Tuesday, so that means we have a great challenge and sponsor over at Tuesday Morning Sketches. Robyn's Fetish is sponsoring and I've had the priviledge of using one of their images. The colors are an inspiration from MTME Pretty Palette: Brown, Light Green, Violet and Burgundy. What a lovely combination. Thanks for stopping by. I hope you join us this week.